The Qur'ān (Arabic: القرآن) is the Muslim sacred scripture, believed to be revealed by God to Prophet Muhammad (s) through Jibril (Gabriel) during 23 years; the Prophet (s) recited it to a group of his companions and scribes of revelation wrote it down under direct and constant supervision of the Prophet (s). Many of the companions memorized the Qur'an and narrated it frequently. The Qur'an has been written at the time of the Prophet (s) though it has not been organized. The Qur'an was organized at the time of 'Uthman under his supervision during several years before 28/648-9, from the Qur'an 1 to the Qur'an 114 including all suras which Muslims believe that its text is holy, definite, Mutawatir (frequently narrated) and its recitation is a very recommended religious act. Historical events such as the battles (Ghazwas) of the Prophet (s), his immigration, etc. The story of Creation, creation of human being, and human soul. The Qur'an is the miraculous divine revelation in Arabic which have been revealed from God to the heart and tongue of the Prophet (s) in exact wording by Gabriel, the trustable angel of revelation, from preserved tablet two times; first, all at once and then during 23 years. And the Prophet (s) recited it for a group of his companions. It was written by writers of the revelation (Kuttab al-Wahy) under direct and constant supervision of the Prophet (s) and many memorizers from among the companions memorized it and narrated it frequently. It was also in written form at the time of the Prophet (s), but it was not still compiled. It was compiled at the time of 'Uthman under his supervision which took several years and was finished in 28/649, beginning by the Qur'an 1 and ending with the Qur'an 114 including all suras. The narration of the Qur'an is Mutawatir, and its text is considered to be holy and definitely narrated exactly as it was revealed from God. Believing in the Qur'an as it was described above, its miraculous nature, its being a proof for prophethood and its inerrancy, is among the requirements of being a Muslim and a Shi'a. The Qur'an was revealed to the Prophet (s) part by part in a very eloquent Arabic which surprised the greatest men of Arabic literature of the time, and had no equivalent example in Arabic history, during 23 years of the Prophet's (s) mission in inviting people to Islam. Memorizers kept it and scribes recorded it in a basic handwritten style without dots and diacritics which was called "Kufi". Then it was rewritten and copied in several manuscripts. The word "Qur'an" is a proper noun referring to this very divine book with its all attributes. About the etymology, pronunciation and meaning of it, there are different opinions among Islamic scholars. Al-Shafi'i considers it coined for the word of God in an improvisational coinage. Al-Farra' considers it derived from the word "Qara'in" (plural for "Qarina" [evidence]). Al-Ash'ari and his followers consider it a derivation of "Qarn al-shay' bi-l-shay'" [linking something to something]; since suras and verses have been accumulated. The Qur'an researchers in the past did not differentiate between names and attributes of the Qur'an, and sometimes listed as many as 90 names for it. Al-Zarkashi, and al-Suyuti in al-Itqan, each mentioned about 55 names for the Qur'an; among which, al-Furqan, al-Dhikr, al-Tanzil, al-Kitab, and Kalam Allah are the famous ones. The Qur'an has also been called with other attributes such as, al-Qur'an al-Majid, al-Qur'an al-'Azim, al-Qur'an al-Hakim, al-Qur'an al-Karim and al-Qur'an al-Mubin. As a book, the Qur'an is middle-sized and it almost has the same volume as the New Testament (the Four Gospels and other included chapters). According to most accurate statistics, the number of the Qur'an's words is 77,807. The Qur'an has 114 suras. The messages in the Qur'an are multitude, highly interrelated and "full of live reiteration". There are many issues mentioned in the Qur'an such as Tawhid (The unity of God), inviting to think about God, inviting to have faith. The Qur'an also prohibits polytheism, hypocrisy, apostasy, and rejects Satan and worshiping the idols. It also mentions many parts of the stories of prophets (a) from Adam (a) to Muhammad (s), and parts of the life and ordinary questions of Arabs contemporary with the Prophet (s) including Lunar phase or even issues such as menstruation, advising about the passing and the transient nature of life and its aspects, such as wealth (or prohibiting of accumulating wealth) and its luxuries, such as boasting on having sons and gardens. The Qur'an also mentions points about revelation, interpretation of the Qur'an, jurisprudential rulings about issues such as sharing the heritage, lashing the adulterers, cutting the thief's hand and different permissions, prohibitions and ethical rulings such as helping the poor, feeding the hungry, greatly respecting the rights of parents, prohibiting the mischief and vices such as usury and killing the children fearing poverty or being an ignorant bigot as it used to be common in the Ignorance Era. The Qur'an also recommends people to enjoy righteous deeds such as sincerity. The are also some other topics in the Qur'an such as describing angels, their actions and tens and hundreds of other interrelated topics which are mentioned side by side to its seemingly unconnected structure. Mentioning historical events, battles, the Prophet's (s) immigration and as such. Small units of the Qur'an are called "verse". In most cases, every verse is one sentence. But sometimes, there are verses which are comprised of some sentences and make a paragraph such as al-Kursi Verse or the al-Nur Verse. Even, there are verses which are about some paragraphs such as the al-Dayn Verse (also called "Tadayun" and "Mudayana") which is the lengthiest verse of the Qur'an and in 'Uthman Taha print (Mushaf al-Madina), it takes a full 15-line page. Sometimes, a verse is shorter than a sentence and even as short as one word, such as Qur'an 55:64) or even shorter than that such as most al-Muqatta'at (disjoined letters) such as "طه" (Ta Ha), "یس" (Ya Sin), "الم" (Alif Lam Mim). Determination of the beginning and the end of verses of the Qur'an is "Tawqifi" (should be determined only by God); since, some of the Muqatta'at have been regarded as one verse such as "المص" (Alif, Lam, Mim, Sad), but some other similar beginnings have not been considered as one verse such as "المر" (Alif, Lam, Mim, Ra); or "حم عسق" (Ha, Mim. 'Ayn, Sin, Qaf) which has been regarded as two verses. But "کهیعص" [Kaf, Ha, Ya, 'ayn, Sad] has been considered as one verse. The word "آیه" [Aya] and its plural form "آیات" [Ayat] means "sign" but is used to refer to these sentences or phrases in the Qur'an. The sura in the Qur'an with the most number of verses is Qur'an 2 (the Cow) with 286 verses. And the sura with the least number of verses is Qur'an 108 with only 3 verses. There are different opinions about the number of verses in the Qur'an. The most authentic opinion is Abu 'Abd al-Rahman b. Habib Sullami's narration from Imam 'Ali (a) which is quoted by al-Shatibi in Nazimat al-zuhr in which the number of verses of the Qur'an is counted as 6236. Larger units in the Qur'an are suras. The word sura سوره means "cut or disconnected" and it refers to an independent group of verses in the Qur'an which have a beginning and an end; and it is also said that it is adopted from the phrase "Suwar al-Madina" (meaning "walls of the city"). The word sura means the same in the Qur'an. Also, its plural form "suwar" has been used in the Qur'an. The Qur'an has 114 suras which are somehow ordered according to their length. The longest sura is Qur'an 2 (having 286 verses which takes 48 pages of 'Uthman Taha (Mushaf al-Madina) print and the shortest sura is Qur'an 108 which has 3 verses. There are different views on whether the order and the sequence of the suras of the Qur'an is Tawqifi, absolute and definite or ijtihadi (depending on judgment of the Companions) and its compilers' opinions and views. Some have said that it is definite according to the order and instructions of the Prophet (s) and revelation. Some others have said that it depends on judgment of the compiler of al-Mushaf al-'Uthmani, because the Prophet (s) compiled the Qur'an but it was not finally organized at his time. Also, some other have said that it is partly definite and partly depending on judgment. Al-Muqatta'at meaning "disjoined letters" and Fawatih al-suwar means "the beginning of suras". They refer to verses or letters in the Qur'an which are coded; i.e. their meanings have not been discovered in a way that all Qur'anic researchers agree on that since the time of revelation. They are 29 example of al-Muqatta'at in the Qur'an containing one letter or a combination of letters, mentioned at the beginning of 29 suras of the Qur'an all of which are Makki (revealed in Mecca) except for Qur'an 2 and Qur'an 3 which are Madani (revealed in Medina). Cave Hira' where the Qur'an was first revealed to the Prophet (s) through Gabriel. The cave is located in Hira' Mountain, which is about 3 kilometers out of Mecca. The noble Qur'an has been revealed in exact words to the heart (faculties of perception) of the Prophet (s) by Gabriel, the angel of revelation from God the way it is recorded in preserved tablet (al-Lawh al-Mahfuz). Revelation is a real and spiritual phenomenon which means sending a message from God to prophets (s), and in the case of the Qur'an, it has been revealed to the Last of Prophets (s). 'Allama Tabataba'i said, "What is understood from the Qur'an is that this divine book has been the result of the revelation given to the noble Prophet (s). Revelation is a heavenly (non-material) communication which cannot be understood neither by intellectual, nor by sensual faculty; rather it can be perceived by another type of perception which some people are granted by God and they receive orders from revelation and divine teachings unseen from the intellect and sense. And taking this responsibility is called prophethood." According to 'Allamah Tabataba'i, the common belief among Muslims about revelation of the Qur'an, which has been originated from the appearance of the Qur'an, is that the verses of the Qur'an are the very words of God which have been revealed to the Prophet (s) by one of the closest angels to God. The name of that angel is Gabriel or "Ruh al-Amin" (the Trustworthy Spirit) who delivered the words of God to the Prophet (s) during 23 years and this way the Prophet (s) was missioned to recite those words to people and teach them their meanings and invite them to ideological teachings, social and civil regulations and individual duties to which the Qur'an calls the people. According to Ramyar, the reality of revelation to prophets (s) has been frequently narrated during history and has been approved by their companions (and even their enemies), even though there are many disagreements about its explanation and justification. Nuzul of the Qur'an is delivering messages from the origin of the revelation (God) to its destination (the heart of the Prophet (s)) during 23 years since Laylat al-Qadr, one of the nights in the last ten days of the month of Ramadan in the first year of Bi'tha (the beginning of the Prophet's (s) mission) (13BH/610) until a short time before the Prophet (s) passed away. When the revelation of the Qur'an, is mentioned as an act of God, it is called "Inzal" and "Tanzil". The first sura revealed to the Prophet (s) is Qur'an 96 (Sura al-'Alaq). Some have said that at the beginning, only the five verses of this sura were revealed. Also, some other scholars believe that the first complete sura which was revealed to the Prophet (s) was Qur'an 1. The last sura revealed to the Prophet (s) was Qur'an 110. Some Qur'anic researchers have said that the Qur'an was at once descended from preserved tablet to Bayt al-'Izza or al-Bayt al-Ma'mur (in the fourth sky) in Laylat al-Qadr and then during 23 years was descended and revealed to the Prophet (s). Fayd Kashani said, "These two kinds of revelation, both mean the revelation of the Qur'an's meaning to the heart of the Prophet (s)… Then every time Gabriel appeared to him and brought revelations during the 23 years, he recited the words for the Prophet (s), and then they would come from inside the heart of the Prophet (s) to his tongue." Throughout the time of revelation, and during the life of the Prophet (s), the Qur'an was available in written form but not organized. It was like disorganized tablets. The text of the Qur'an was written by basic pens on things such as pieces of leather, flat bones of sheep and camel's shoulder, woods of palm trees, smooth stones, pieces of silk clothes and few pieces of paper. At that time, the important point was that many of the companions had memorized the Qur'an. Suras of the Qur'an were complete and even had names but until the end of the Prophet's (s) life, the Qur'an was still not compiled in one book. The most important reasons why the Qur'an was not finally compiled during the Prophet's (s) life time was that the opportunity for future revelation was still open, and at any stage of the revelation, when verses revealed, the Prophet (s) told scribes of the revelation (Kuttab al-Wahy) to put those verses in which sura and between which verses. Therefore, it would not be possible to compile the Qur'an in one book before the end of the revelation. Some believe that the best way for keeping the Qur'an at the time of the Prophet (s) was that people keep it by heart. During the days of revelation, the Prophet (s) perfectly supervised the writing of the Qur'an and taught or encouraged the people to write, read, and memorize the Qur'an. During his life, 37 people memorized the whole Qur'an. The number of the scribes of the Qur'an –some of whom were also memorizers of the Qur'an as well– and those who wrote a copy for themselves at the time of the Prophet (s) reached 50 people. The result was that when the Prophet (s) was about to pass away (11/632), the Qur'an was fully confirmed and approved upon submission of the Prophet (s). The Prophet (s) read it himself and read it to Gabriel once a year and twice in the last year of his life. It was that time when the Qur'an was completely and officially written. This Qur'an which is kept in Qur'an Museum of Astan-i Quds-i Radawi, is attributed to Imam 'Ali (a). This manuscript was donated by Shah 'Abbas I to the shrine of Imam al-Rida (a). After the Prophet (s) passed away, Imam 'Ali (a), who was more familiar to the Qur'an than anyone else according to the Prophet's (s) acknowledgement, collected and compiled the Qur'an in one book and less than 6 months after the Prophet (s) passed away, Imam 'Ali (a) loaded the book on a camel and brought it to people, but rulers of that time said they didn't need it. The Battle of Yamamah, in which many of those who had memorized the Qur'an were killed (counted even as many as 70 individuals). Following 'Umar's suggestion, Abu Bakr accepted that the Qur'an needed to be compiled soon so that it would be preserved. To do so, he chose Zayd b. Thabit who was among the youngest and most hardworking scribes of revelation and a memorizer of the Qur'an who had a compilation of the Qur'an for himself. Zayd collected all scattered manuscripts of the Qur'an and confirmed every verse, even though being written in many places and recited by many memorizers, he chose them only if there were two evidences for its correction (one written and one from memorization). The Qur'an collected by Zayd b. Thabit was still in the form of pamphlets, not a book. They put them all in a box and appointed a person to guard it. This collection took 14 months before the death of Abu Bakr. This version was submitted to 'Umar according to Abu Bakr's will. After 'Umar died, they gave it to his daughter Hafsa, the Prophet's (s) wife as 'Umar had willed. 'Uthman reached caliphate in 24/645. At his time, together with Muslims' victories and familiarity of new lands with the Qur'an, many disagreements occurred in recitation of the words of the Qur'an. And this was a new problem for 'Uthman to complete the unfinished task of compiling the Qur'an and remove the threat of disorganization of the Qur'an and Islamic society. He assembled a group including Zayd b. Thabit, Sa'id b. al-'As, 'Abd Allah b. al-Zubayr and 'Abd al-Rahman b. al-Harith. This group collaborated with 12 people from Quraysh and the Helpers (Ansar), (upon whose work Imam 'Ali (a) somehow supervised and encouraged them to clarity in the their handwriting) and they began writing the complete version. What they did first was to collect all the writings at the time of the Prophet (s), then they borrowed the version Zayd had compiled at the time of Abu Bakr from Hafsa. They agreed that when the three colleagues of the Zayd found a disagreement with him over the way of writing of a word, they write it according to the accent of Quraysh. Therefore, the work of the final compilation progressed based on pamphlets remaining from the time of the Prophet (s) and the special versions trusted with Hafsa and Zayd's own version and relying on the memory of the memorizers and the claims of witnesses and the Imam Mushaf which was the final official Mushaf, known as "al-Mushaf al-'Uthmani" was finished between 24/644 and 30/650 and 5-6 copies were made from it. Two copies were kept in Mecca and 3 or 4 other copies accompanied by a memorizer of the Qur'an as the tutor and guide for correct recitation were sent to important cities of the Islamic world, i.e. Basra, Kufa, Syria, and Bahrain. Then, 'Uthman ordered that all other pamphlets, tablets, bones, animal skins, leathers, silk cloths and alike on which some verses of the Qur'an were written and companions had collected for the final copy to be boiled with water and vinegar so that the text written on them dissolved. Some researchers say that they burned these works or eliminated them in some other ways so that the cause for any possible dispute would fully be removed and Tawhid al-Nass [unity of the text] would be achieved. This final compilation of that time was written in basic Kufi handwriting without any dots, let alone having any diacritics. During the next one or two centuries, diacritics and dots were gradually added in the copies of the Qur'an. Manuscript of the Quran. Brooklyn Museum. Differences of accents; e.g. Tamimi people used to say "'Atta 'In" instead of "Hatta Hin" (Qur'an 12:35). Lack of dots and diacritics: some efforts were made to solve this problem in the first century at the time of al-Hajjaj b. Yusuf, but it lasted until the end of the third century to be completed. Individual judgements of companions, reciters of the Qur'an, and Qur'an researchers, each of which group had a special understanding of the meaning of verses and their words. Being far from the first age and the origin of Islam, Mecca and Medina. Lack of punctuation and mechanism for stopping or continuation while reciting the Qur'an, which were later discussed in the studies of recitation and tajwid. From the end of the 2nd/8 century and the beginning of the 3rd/9, the efforts for finalizing the recitation were begun and many reciters tried to determine the most correct recitation from among all recitations. The first persons who made such an effort were Harun b. Musa (201/816 – 291/904), Abu 'Ubayd al-Qasim b. Sallam (157/774 – 224/839) who listed 25 authentic reciters including the Seven Reciters and recorded their recitations. One century later, Abu Bakr b. Mujahid (245/859 – 324/936) who was a prominent Qur'an scholar chose Seven Reciters in 322/934 from among the many reciters available who became the top authorities in recitation of the Qur'an. Later, three other great reciters were added to these seven reciters. However, the Fourteen Reciters and Twenty Reciters are also known in the history of recitation as well; but, the Ten Reciters are those, the chain of narrators to whose recitation goes back through the followers of the followers of the Followers to the Companions whether they were scribes, memorizers of the Qur'an or others and they narrated from the Prophet (s). The Seven Reciters have frequently been quoted, but later Qur'anic researchers approved the reports of two of the references each reciter referred to if those reports were more acceptable regarding accuracy of record, authenticity of reference, period of association of the reciter and his reference and their education before the Seven Reciters. Therefore, 14 recitations emerged. The three other reciters added to the list above makes the list of the Ten Reciters. Scholars who studied the Qur'an and Usul have extensively discussed the authority of the Seven and Ten Recitations. Although among Muslims, whether Sunni or Shi'a there have been few people who thought that some issues have been omitted from the Qur'an; however, the consensus among Muslims is that the current text of the Qur'an has been passed through generations of Muslims and nothing has been added to or omitted from it. Contemporary Shi'a Mujtahids and religious authorities, in reply to questions (Istifta') made about the alteration of the Qur'an, have clearly rejected any alteration in the Qur'an and confirmed its integrity. Geography: What has been revealed in Mecca (and its suburbs), even after immigration to Medina is Makki. And what has been revealed in Medina (and its suburbs) is Madani. People: What addresses the people of Mecca (usually begun by "Ya Ayyuha al-Nas" [O people!] or "Ya Bani Adam" [O sons of Adam!) are Makki and what addresses the people of Medina (usually begun by "Ya Ayyuha l-Ladhin-a Amanau" [O you who have faith!]) is Madani. Time: Researchers have considered this criteria more comprehensive and more definite than the two other ones. It suggests that the suras and verses which have been revealed before Hijra are Makki and those which have been revealed after Hijra are Madani; whether they have been revealed in Mecca, Medina or in journeys and battles. Distinguishing which is Makki or Madani is upon hear each and the criteria are what have been received to us from the Prophet (s), his Companions and their Followers. The meaning of the word "Naskh" (Arabic: نسخ) is abrogation and invalidation. In Qur'anic sciences, it means revoking previous legislation – which has been apparently deemed for permanence – and issuing a new legislation, so that they cannot coexist either due to their essence, obvious conflict or a certain reason in consensus or clear authentic reference. Or in a simpler words, abrogation of a ruling by another legitimate reason. Or ending obedience of a recitation or a ruling understood from it or both. Verses of the Qur'an are two types. Most verses are those which have been revealed to the Prophet (s) based on divine will without any circumstantial cause. Other verses are less and they are those which have been revealed after an accident or a cause. The occasion of revelation is a cause or accident which has occurred at the time of the Prophet (s) and has led to revelation of a verse or verses. There are many verses in which words such as "Yas'alunaka" یسئلونک (they ask you) and its derivatives or "Yastaftunaka" یستفتنوک mention a question made to the Prophet (s) about divine will. The Arabic word, "muhkam" is derived from "Ihkam" which literally means definitude. A Muhkama verse is the one which has a clear and definite meaning, not ambiguous; and according to al-Raghib al-Isfahani, "when there is no doubt about the meaning of a verse either in its words or its whole meaning"; such as many verses of rulings (Ayat al-Ahkam), advices, and moral instructions in the Qur'an. The word "mutashabih" is derived from "tashabuh" (English: "ambiguity"). A mutashabih verse is the one which according to al-Raghib, "its appearance does not reflect its meaning". Al-Shaykh al-Tusi wrote, "muhkam [verse] is the one, so clear an a way that its meaning can be understood merely by attending to its appearance without any inference or [outside] reference… and mutashabih [verse] is the one the meaning of which could not be understood from its appearance, unless an [outside] reference is provided in order to show its meaning." In other words, mutashabih is a word which suggests different possible meanings and thus needs interpretation, either a right interpretation or wrong one; such, as many verses of the creation (creation of human beings and skies and divine will, attributes and actions). Majority of verses are muhkam and few of them (around 200 verses) are mutashabih. When disbelievers of Mecca encountered the call of the Prophet (s) and the word of God, they avoided hearing it and prohibited others from them as well or they would say, "It is nothing but the speech of a human being. '", or they would say, "If we want, we [too] can say like this. These are nothing but myths of the ancients.'" That is when God calls them to challenge and asks deniers and enemies that if they deem the Qur'an non-divine, they bring something similar to it. And this call for challenge is general and addresses all human beings for all the times. In the ages near the mission of the Prophet (s) and later centuries, some people such as Musaylama al-Kadhdhab accepted the challenge with the Qur'an, but they only could put together some disconnected words without even ordinary meaning which were neither similar to the Qur'an, nor like normal speech. And that is the way, miraculous nature of the Qur'an has been proved. Its legislations which agree with sound reason and nature and meet the happiness of both worlds. It includes news from the Unseen world (al-Ghayb), both about past and future. It enjoys a resolute speech void of any conflict or paradox, even though it was revealed concurrent with many accidents during 23 years. Miracles of previous prophets (a) have been mostly material, but the Qur'an which is the eternal miracle of Islam and the Prophet (s) is an intellectual miracle. According to a famous saying, the miracle of every prophet has been corresponding to condition of his time and because, at the time of the Prophet (s) of Islam, poetry and literature was regarded as a great talent among Arabs, God chose a verbal miracle for the Prophet (s). On the other hand, the last and eternal religion needed a lasting miracle; thus, the Qur'an is a lasting book which provides this condition. The literary-verbal miracle in which the absolute majority of Twelver Shi'a scholars believe including many Sunni researchers of the Qur'an and literature such as al-Jahiz, Qadi 'Abd al-Jabbar, al-Zamakhshari, 'Abd al-Qahir al-Jurjani, al-Sakkaki. Theory of Sarfa (withdrawal): according to this theory, the miraculous nature of the Qur'an cannot be found in it or considered to be its great eloquence and literary-verbal greatness, but it is the fact that God has drawn away the attempts opposing it; i.e. has withdrawn the thought of those who wanted to oppose and challenge it by bringing a similar one. From among Twelver Shi'a scholars, al-Sayyid al-Murtada and al-Shaykh al-Mufid support this theory. However, this theory is weak and vulnerable, since it does not suffice essential and literal-verbal values, content and style of the Qur'an for being a miracle. The reason why these scholars and Mu'tazila (who issued this theory), Ibn Hazm al-Zahiri and other Asharites defended the theory of Sarfa would be that they regard the theory of literal-verbal theory inadequate and they for example believe that great literary works of every nation are miraculous, unchallengeable and unparalleled. One of the theological discussions about the Qur'an is that whether the Qur'an is the words of God which has always been with Him and is pre-eternal like Him, or it is contingent like this world and the whole creation. This discussion emerged since the beginning of Islamic theology. According to the Qur'an, "takallum" (speaking) is an act of God. Asharites believe that the Qur'an is "Kalam Nafsi" (speech of the self), depending upon the self, as eternal as He is, and it's among His attributes of essence. But, Mu'tazila and Shi'a believe that divine speech is among God's attributes of action and the Qur'an is a verbal speech, thus it is contingent. This issue is not among Muslims' ideological principles, secondary beliefs or even the requirements of being a Shi'a Muslim or non-Shi'a Muslim, however, in the 3rd/9th century, there were great social conflicts on this subject, beginning at the time of Harun al-Rashid, reaching its peak at the time of al-Ma'mun, al-Mu'tasim, and al-Wathiq and it ended at the time of al-Mutawakkil. The authenticity of the Book (the Qur'an) is a discussion which is more discussed about in principles of jurisprudence and it addresses whether readers who have a common culture and know Arabic would be able to understand the Qur'an correctly or they would need to refer to other references to obtain a correct understanding. In an article having this discussion with the same title, al-Khoei wrote that, "there is no doubt that the Prophet (s) did not invent a special way to deliver his messages, but he (s) spoke with his people using the methods of understanding and discourse they were familiar with and he (s) brought them the Qur'an, they could understand its meaning, reflect upon its verses, obey its orders and prohibitions and this has been clearly explained in many verses. Also, there are other verses which suggest the necessity of obeying the content of the Qur'an and understanding it from its appearance." The science of interpretation is the study of meaning of the verses of the Qur'an. Understanding God's messages from the Qur'an at the level of human understanding according to the rules of Arabic language and the Book of God, delivered by the Prophet (s) and his successors which would not be in conflict with reason, the Book itself, tradition and consensus. The knowledge about the Qur'an to understand God's message at the level of human understanding. The knowledge in which the Qur'an is discussed from the aspects of revelation, reference, recitation, wording, meanings of words and rulings. Knowledge of hadiths which explain concise and ambiguous verses. Knowledge of Mawhaba, which is the knowledge that God gives the one who acts upon what he knows and it refers to this hadith that "anyone who acts upon what he knows, God will give him what he does not know." After listing the above factor, al-Suyuti adds that, "anyone who interprets the Qur'an without having these sciences, he has made interpreted according to his personal judgment (tafsir bi-l-ra'y) which has been prohibited by traditions. The word "Ta'wil", literally means "to refer" and it is used in the Qur'an. There was no difference between Ta'wil and Tafsir in early centuries of Islam, as al-Tabari always uses the word ta'wil in his commentary and he means tafsir. In al-Mustasfa, al-Ghazzali wrote, "Sometimes, ta'wil refers to interpreting the speech and the meaning, as in unclear verses, sometimes in interpreting dreams and ruling such as in the story of Prophet Joseph (a) and sometimes in interpreting actions such as in the story of Prophet Moses (a) and Khidr (a) it is used. In usage, ta'wil means to understand inferences in a speech from apparent meanings without violating Arabic norms and syntax, in agreement with the rules of abstraction, such as calling something by or because of its analogue, by what comes after it or by its parallel, etc. Some scholars have considered ta'wil as "Tawjih al-Mutashabihat" (justification of the unclear) and "discovering secondary meanings of speech from its heart opposite to its apparent meaning [Zahir]. In al-Tamhid al-qawa'id, the author gives another definition for Tawil which is the hidden meaning of speech which needs a clear outside reference to be understood. For the necessity of ta'wil for the Qur'an, the Imams (a), Companions and also Qur'an researchers of later centuries have clear statements, but undoubtedly ta'wil is not everyone's job. In a simple definition, tajwid is the science and rules of correct Arabic recitation and tartil is the skill of correct recitation of the Qur'an. Tajwid is considered among religious and Qur'anic sciences and traces back to the time of the Prophet (s) and his observation of correct pronunciation of Qur'anic words and teaching correct recitation of the Qur'an. Tajwid is one of the branches of the science of recitation. Its difference with recitation is that recitation deals with correct recording of the words in the Qur'an where both its diacritics and form are correct, but tajwid works after recitation and recording the text and deals with correct pronunciation of the words. Tartil is the skill of correct recitation of the Qur'an in a measured tone and it has been recommended several times in the Qur'an especially in the third verse of Qur'an 3:3, "... and recite the Qur'an in a measured tone." When they asked Imam 'Ali (a) about this verse, he (a) said, "Tartil is correct articulation of letters and knowing the stops [in the Qur'an]." A recurrent theme in the Qur'an is the stories of prophets (a), nations and other stories which contain many points and pieces of advice. Studying and understanding Qur'anic stories is a branch of Qur'anic sciences. As it is said about the style of the Qur'an, the Qur'an's speech is not constant and monothematic; rather, it is a blend of various topics and it hardly contains a full story from the beginning until the end narrated in subsequent verses, for example the story of Prophet Abraham (a) is not only mentioned in Qur'an 14; also, in Qur'an 14, there are other stories as well; while, the rest and even most of the story of Abraham (a) can be found in Qur'an 2 and other suras. In 15 suras, Abraham (a) has been mentioned. Also, different parts of the story of Prophet Moses (a) have been mentioned in 21 suras. The only exception, i.e. a complete narration of a story is the story of Prophet Joseph (a) and his brothers in the Qur'an 12. Some personalities in the stories of the Qur'an: Adam (a), Azar, Iblis, Idris (a), Ishaq (a), Isma'il (a), Ashab al-Ukhdud, Ashab al-Rass, Ashab al-Raqim, Ashab al-Kahf), Ashab al-Sabt, Ashab al-Safina, Banu Adam, Banu Isra'il, Eve (without mentioning the name), Hawariyyun, Khidr (a) (al-Rajul al-Salih), Dawud (a), Dhu l-Qarnayn, Zakariyya' (a) (Zechariah), al-Samiri, Sulayman (a) (Solomon), Shu'ayb (a), Salih (a), Jesus (a), Maryam (a), Fir'awn (Pharaoh), Haman, Lut (a), Moses (a), Namrud (Nimrod), Noah (a), Habil (Abel), Qabil (Cain), Harut and Marut, Hud (a), Ya'juj and Ma'juj, Yahya (a) (John the Baptist), Ya'qub (a) (Jacob), Yunus (a) (Jonah). In jurisprudence and principles of jurisprudence, the Qur'an is called "al-Kitab" (the Book) which is the first and most important reference for legislation of rulings and the origin of jurisprudence. "The Qur'an is the comprehensive reference for divine rulings and the means for evaluation of reports and hadiths and that is why it has been used by Islamic scholars as the primary source of rulings since the time of the noble Prophet (s) and the history of jurisprudence and ijtihad proves this claim." It is famously said that the verses of the Qur'an about the rulings are about 500; but, understanding the Qur'an needs great knowledge and expertise in different literary and linguistic sciences. Translating the Qur'an has a long history and it is famous that Salman the Persian translated some parts of Qur'an. Shi'a scholars have always supported translating the Qur'an except for the prayer. The knowledge of translating the Qur'an can perhaps be linked with tafsir of the Qur'an. The history of Qur'anic sciences is very old and some Qur'anic sciences which are mostly traditional and depending on hadiths such as nasikh and mansukh and causes of the revelation are as old as the sciences of hadiths and hadiths narrated from the Infallibles (a). However, some Qur'anic sciences such as the knowledge about the miraculous nature of the Qur'an or diacritics in the Qur'an are newer. Al-Zarqani wrote, "the first work written in Qur'anic sciences is al-Burhan fi 'ulum al-Qur'an written by 'Ali b. Ibrahim b. Sa'id known as al-Hufi (d. 330/912). It has 30 volumes and its 15-volume version is being kept in Dar al-Kutub al-Misriyya. The history of printing the Qur'an dates back to the beginning of the history of printing in Europe and the rest of the world. The Arabic text of the Qur'an was printed by Paganini in Venice for the first time between 908/1503 and 929/1523, but all the copies were collected and destroyed by the order of Pope. 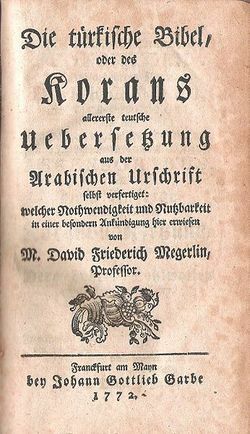 Next time, Abraham Hinkelmann printed the Qur'an in Hamburg in 1105/1694. One of the most important old authentic prints of the Qur'an in Europe was Flügel's (Leipzig, 1249/1834). After the prints in Italy and Germany, the first time the Qur'an was printed for Muslims was in Saint Petersburg, Russia in 1201/1787. The turning point in accurate and scholarly printing of the Qur'an has been made in Cairo, Egypt. Subhi Salih wrote, "In Cairo, in 1342/1923, an accurate and beautiful print of the Qur'an was made under supervision of shaykhs of al-Azhar University by the efforts of a committee appointed by Malik Fu'ad I. This Qur'an was published based on the report of Hafs from 'Asim's recitation, and the Islamic world greatly welcomed it. This print in Cairo was decided to be the reference for writing of the famous Syrian calligrapher 'Uthman Taha and his handwritten version was published and distributed in different sizes in many copies in Syria. Later in the first years of the 15th/21th century, Malik Fahd's assembly printed the same 'Uthman Taha's version after he appointed a group of experts in the Qur'an who made many accuracy checks and technical scrutiny using the best printing facilities in the most beautiful way. They reprint it in more than 2 million copies and gift them to Hajj pilgrims and religious institutions worldwide every year. This version written based on 'Uthman Taha's handwriting and its recitation (Hafs from 'Asim) which is also accepted by Twelver Shi'a have been accepted in the whole Islamic world and worldwide and it can be regarded as the official print of the Qur'an in Islamic world. This can have a very positive role in the unity of Sunni and Shi'a. Most Arabic dictionaries including Lisan al-'Arab and the ones before it and those after it including al-Mu'jam al-wasit and those after it contain examples and evidences from Quranic words and expressions. Moreover, many general sources and special dictionaries of the Qur'an have been published since the early periods of Islam. 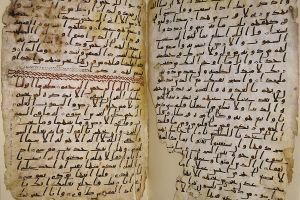 The oldest dictionary of the Qur'an is Masa'il Nafi' b. Azraq (Nafi' b. Azraq's questions from Ibn 'Abbas) which are all mentioned in al-Suyuti's al-Itqan. Another report about such a glossary is the one with the title Mu'jam al-gharib, adopted from Sahih al-Bukhari and reports almost the same glossary as of Nafi' b. Azraq from Ibn Abi Talha from Ibn 'Abbas. Other old dictionaries of the Qur'an are, Majaz al-Qur'an written by Abu 'Ubayd Mu'ammar b. al-Muthanna (d. 210/825) (which is more than just a dictionary and explains complicated and abstract expressions as well); Ta'wil mushkil al-Qur'an and Tafsir gharib al-Qur'an, both written by Ibn Qutayba (d. 210/825). The next prominent work was al-Mufradat written by al-Raghib al-Isfahani (d. 401/1010) and the complete title is Mu'jam mufradat alfaz al-Qur'an. It has been printed for many times. Other dictionaries of the Qur'an are, Qamus al-Qur'an written by Faqih Damghani; Wujuh al-Qur'an written by al-Tiflisi which is Arabic – Persian like Lisan al-tanzil (anonymous author) and Mir Sayyid Sharif al-Jurjani's Tarjuman al-Qur'an. One of the dictionaries written by Shi'a is Fakhr al-Din al-Turayhi's Majma' al-bahrayn which is the dictionary of the lexicon of the Qur'an and hadiths. Al-Turayhi's another work is Tafsir gharib al-Qur'an which explains the words in the glorious Qur'an. Contemporary Qur'an researchers have also written valuable references to explain the words in the glorious Qur'an such as Hasan Mustafawi's al-Tahqiq fi kalimat al-Qur'an al-Karim in 14 volumes. Da'irat al-fara'id, dar farhang-i Qur'an written by Sayyid Muhammad Baqir Muhaqqiq. Qur'anic indexes are two types: lexical and topic-based. Lexical indexes which are the lists of Qur'anic words are called "Kashshaf al-ayat" and the history of their publication dates back to 3 to 4 centuries ago. Topic-based indexes -called Kashf al-kalimat- aims to give a complete list of all Qur'anic words even letters such as "Waw" (Arabic: "واو"). However, they have similarity in title and structure. One of the most important and famous Kashf al-kalimat for the Qur'an is Nujum al-furqan fi atraf al-Qur'an written by the German orientalist and Qur'an researcher, Gustav Flügel (1216/1802 – 1286/1870). In contemporary times, the famous Qur'an researcher and writer, Mahmud Ramyar (d. 1405/1985) wrote the best history of the Qur'an in Farsi and list of words which is like an alphabetical Kashf al-ayat. The alphabetical order of this work is based on the appearance of the words, not their origins, and therefore using it is easier for Farsi speakers. It has been published in 1386/1967 with the title "Qur'an mubin wa faharis al-Qur'an". The most famous and frequently used Kashf al-ayat is al-Mu'jam al-mufahras li-alfaz al-Qur'an al-Karim compiled by Muhammad Fu'ad 'Abd al-Baqi (d. 1388/1968). It has listed important words of the Qur'an alphabetically according to their roots together with a part of the verse including that word. It is a small but useful reference. Some topic-based indexes of the Qur'an are called Fihris al-matalib, Kashf al-matalib, or Tafsil al-ayat. The most famous yet least useful work in this field is Tafsil al-ayat written by the French orientalist, Jules Le Beaume (1293/1876) who categorized the Qur'an in 18 chapters including 350 topics. I'timad al-Saltana's Kashf al-matalib is a more extensive topic index of the Qur'an based on the mentioned work of Le Beaume. Ramyar's Fihris al-matalib accompanied with the previously mentioned glossary or Fihris al-alfaz is again a more extensive account of the work of Le Beaume. The most comprehensive and methodical topic-based index of the Qur'an which has been analytically indexed using modern approaches is Farhang-i muwzu'i-yi Qur'an-i Majid (al-Fihris al-mawdu'i li-l-Qur'an al-Karim) compiled by Kamran Fani and Baha' al-Din Khurramshahi. Tarikh al-turath al-'Arabi written by Fuad Sezgin, vol. 1. Fihrist-i nuskha-ha-yi khatti-yi Farsi, written by Ahmad Munzawi (Tehran, 1970), vol. 1310-1/1 which has introduced 1151 manuscripts about Qur'an researches. Fihris makhtutat dar al-kutub al-zahiriyya compiled by Salah Muhammad al-Khiyami (Damascus, 1404/1983–1405/1984). 3 parts of this comprehensive multi-volume index which was written in Arabic and introduced manuscripts of Zahiriyya library of Damascus are about Quranic sciences and Qur'an researches. Fihrist-i muwzu'i-yi nuskha-ha-yi khatti-yi Arabi-yi ketabkhana-ha-yi Jumhuri-yi Islami-yi Iran, 'Ulum-i Qur'ani, bakhsh-i awwal Qira'at wa tajwid. Written by Dr. Sayyid Muhammad Baqir Hujjati (Tehran, 1992). Mu'jam al-darasat al-Qur'aniyya containing around 20 thousand entries of printed and manuscript of books and articles in any languages written by 'Abd al-Jabbar al-Rufa'i which was published in 2 volumes by Markaz-i Farhang wa Ma'arif-i Qur'an and publishing its other volumes is continued. Mu'jam al-darasat al-Qur'aniyya 'inda l-Shi'at al-Imamiyya written by 'Amir al-Hulw. One of the most important and comprehensive bibliographies of the Qur'an is Kitabnami-yi buzurg-i Qur'an-i Karim compiled by Muhammad Hasan Buka'i. The material for writing this article is mainly taken from قرآن in Farsi WikiShia. This page has been accessed 46,913 times.